Yes all the little things about your outfit can really make a difference. For the most part I tend to dress pretty simple with some detail that will stand out. That way I can avoid buying things that are super trendy and focus on clothing items I can wear for several seasons. Here are some little details I have been recently sporting. This is the color I am currently wearing. Its this perfect pinkish brown color I like. It really reminds me of my fave lip liner. I originally purchased this to fill my current crave for mannequin hands, buts its a little darker than that. But that's OK because I really like this color on me. It is OPI "Barefoot in Barcelona". I am currently in love with this panther ring I recently purchased from Forever 21. Its silver with a bunch of rhinestones all around. I think the edgy ring adds a little bit of toughness to the plain black and white shirt and jeans I was wearing on casual Friday at work. Here I am wearing the Ann Taylor Loft waterfall tee that I got at a great discount during the holiday season. It ended up only costing me about $8 for the shirt. It was so cute I had to buy it in a bright pink as well. I love the ruffles on the shirt. I can never have too many ruffles :) Here I paired it with black Express slacks, light pink Forever 21 cardigan, and a black skinny Target belt. I also wanted to take a moment to mention these two lovely ladies who gave me an award on their blog. Its this little acknowledgements that make my day and make me want to keep blogging. 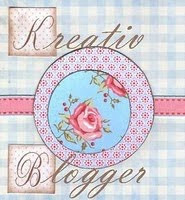 This Kreativ Blogger award was given to me by Rebecca from Mustangs and High Heels. She asked me to share some random facts about myself, but I did that not too long ago which you can read here. I also received the "Easy on the Eyes" award from the lovely Andi at Saltwater Dreams. Andi always has great fashion and beauty advice. What are your favorite little details to add to your outfits? Do you like to accessorize? I finally found a great gift for my giveaway, now I just have to get to 100 posts and think of what type of contest I will have for it. I love that nail polish. Thanks for sharing! Thanks for visiting my giveaway over at bonbon girls! I definitely have some simple necklaces that would go well. If you find something let me know. I can get you discounted shipping!